As a trainer, writer, speaker, consultant… and whatever it is that I do, I need a lot of input. If i would be a good communicator, I must also get a lot of information and data all the time. There is a need for me to read, and to read a lot. While I still enjoy reading, I have a huge waiting line in my reading list and I have been trying to find more and more time to read. Since I take a lot of long trips, the travel time would have been a great time to catch on my reading right? However, I am unable to do so because I have some motion sickness… Fail! The next best thing? Podcasts. 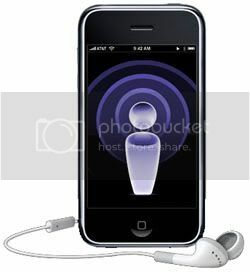 I’ve been subscribing to some podcasts and they are very convenient for an information junkie like me. So what’s in my podcast subscription list right now? 1) Ravi Zacharias: Ravi and his team are my favorite Christian Apologetics and they have 2 programs over at iTunes — Just Thinking and Let My People Think. Listening to Ravi and his team’s podcasts is an absolute must for me… this is nourishment for my spirit and my brain as well. If you doubt your faith and if you doubt God, listen to Ravi Zacharias! 2) The Dave Ramsey Show: I try to catch Dave’s radio podcasts and his podcasts are always updated over at iTunes. I get a lot of practical personal finance knowledge from Dave Ramsey, I just love his no nonsense approach to money. I must admit though that I haven’t been listening to Dave’s show as much of late. Looks like I need to do so again. I’ve also recently subscribed to the podcasts of Seth Godin and the The Economist. Seth Godin was introduced to me by my good friend Carlo Ople and my pastor Dennis Sy. The Economist was a magazine/journal I used to read a lot before, good thing they now have podcasts. While reading books/journals are still best, podcasts may be the next best thing. However, there’s still one book that I must read everyday and no technology can be a good substitute for me, the Bible. ps – I still like to read books by the way, I just need to find time to do so. Will share my reading list soon. I got a free download of the NT audio books from Faith Comes By Hearing and put them in my iPhone. I think it was more than a year ago already so I hope the download is still available. You may want to try that.